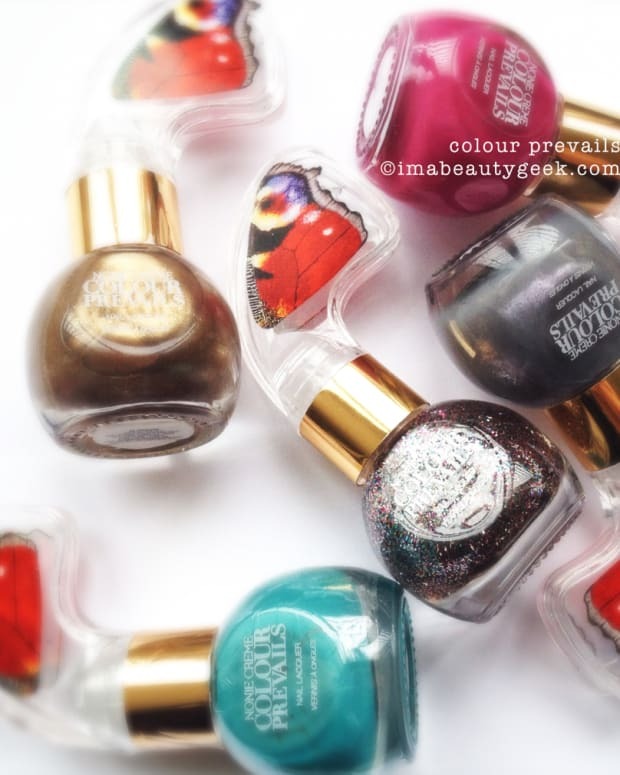 The Body Shop Colour Crush nail polish collection is coming this October and I tell ya what – it’s 100% nail happiness in 23 shades + a base/top coat combo. Was I able to get ’em to show you? You betcha! UPDATE: the line is now online and in stores(click here for thebodyshop-usa.com). 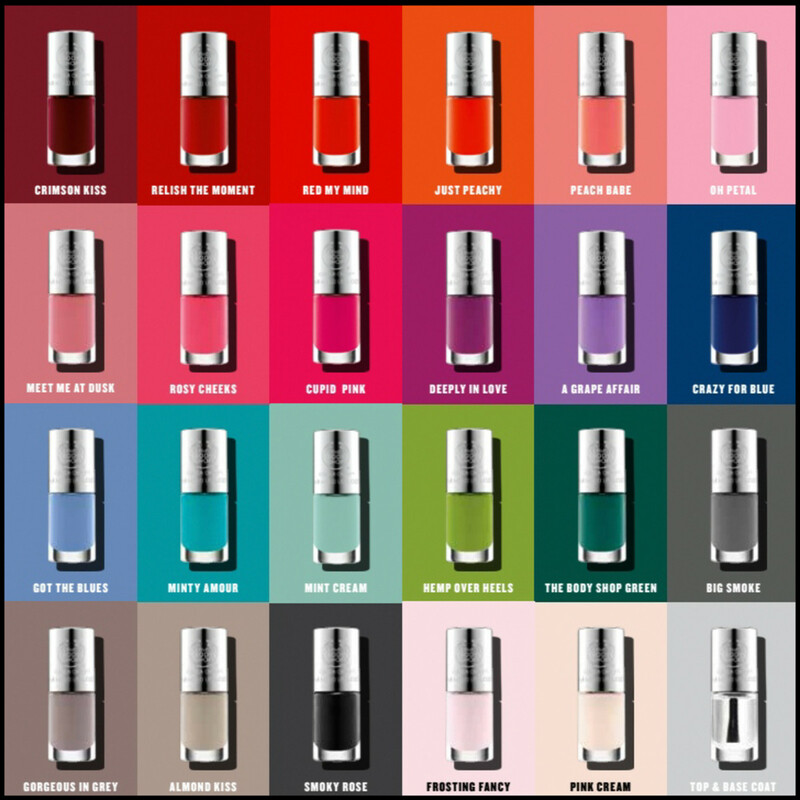 I know you’re really here for the 23 polish swatches so we should get to lookin’ and you should prepare to go blind from so many pictures. After that, I’ll babble about formula, application and other stuff too. I think it might also be important to note that all the photos were taken in natural light as I was sitting at my desk. No light box, no lamps, no Photoshop (save the watermark), and the colors on my side of the screen are perfecty accurate. 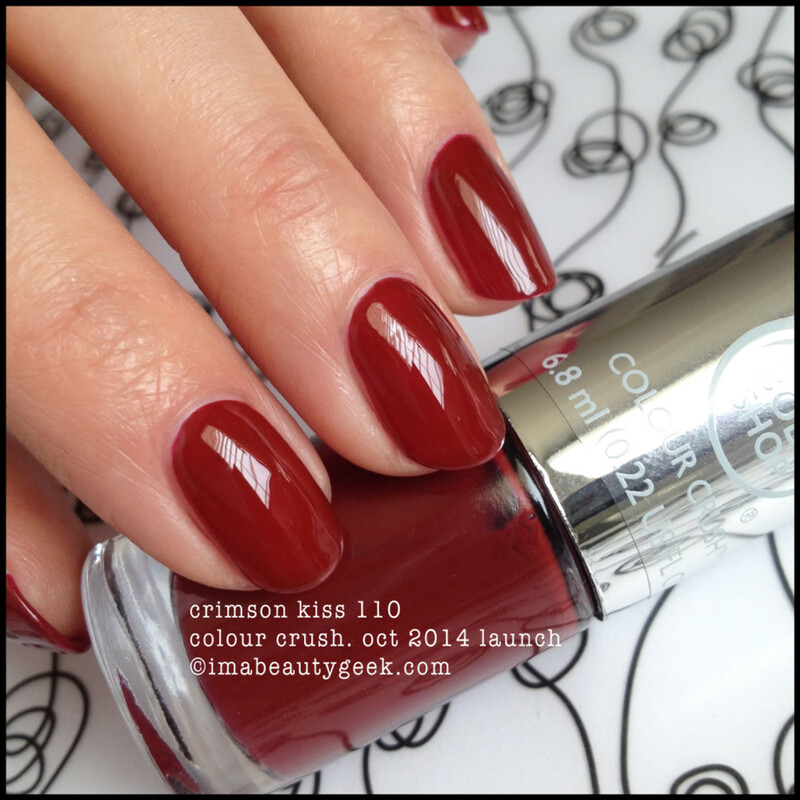 above: the body shop colour crush crimson kiss 110 Well that’s a perfect Bordeaux red, right? 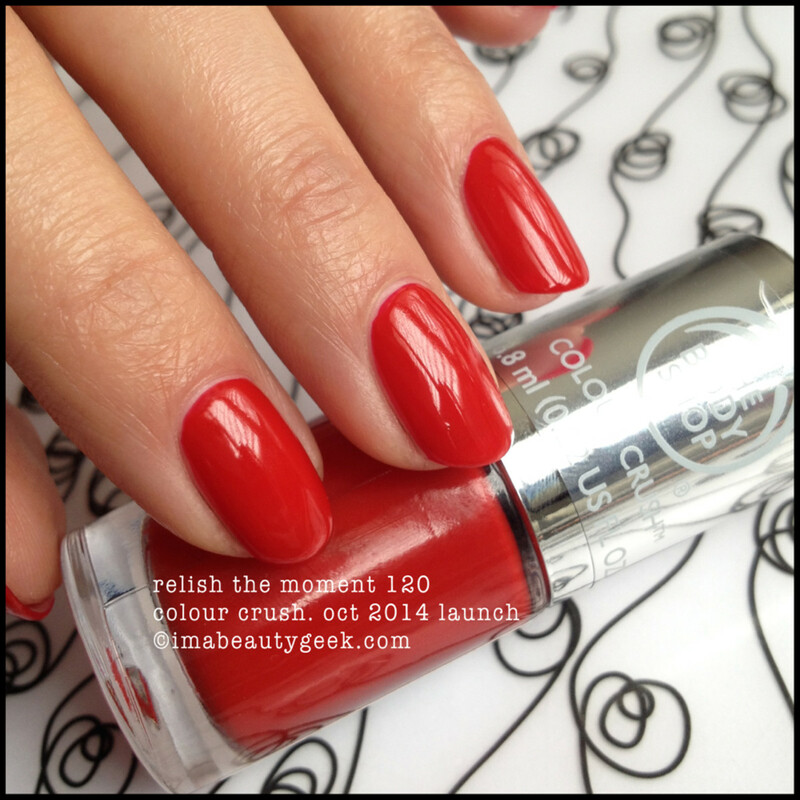 above: the body shop colour crush relish the moment 120 OCW! !• Yep, a perfect poppy red. 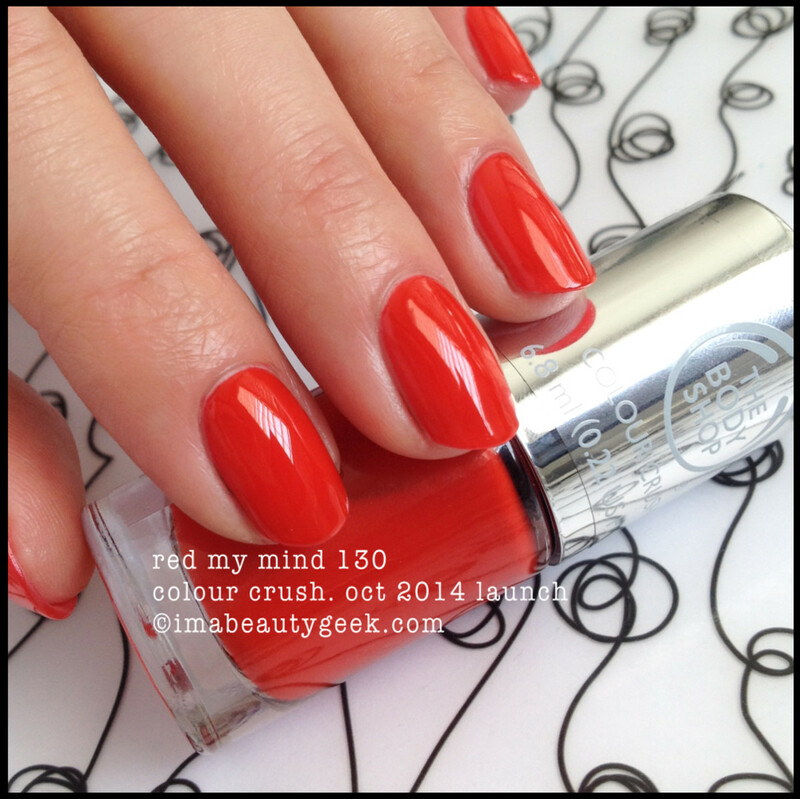 above: the body shop colour crush red my mind 130 The formula on this orangey-red is a tiny bit thin - it wants to migrate and flood your cuticles so keep that in mind when you start painting. 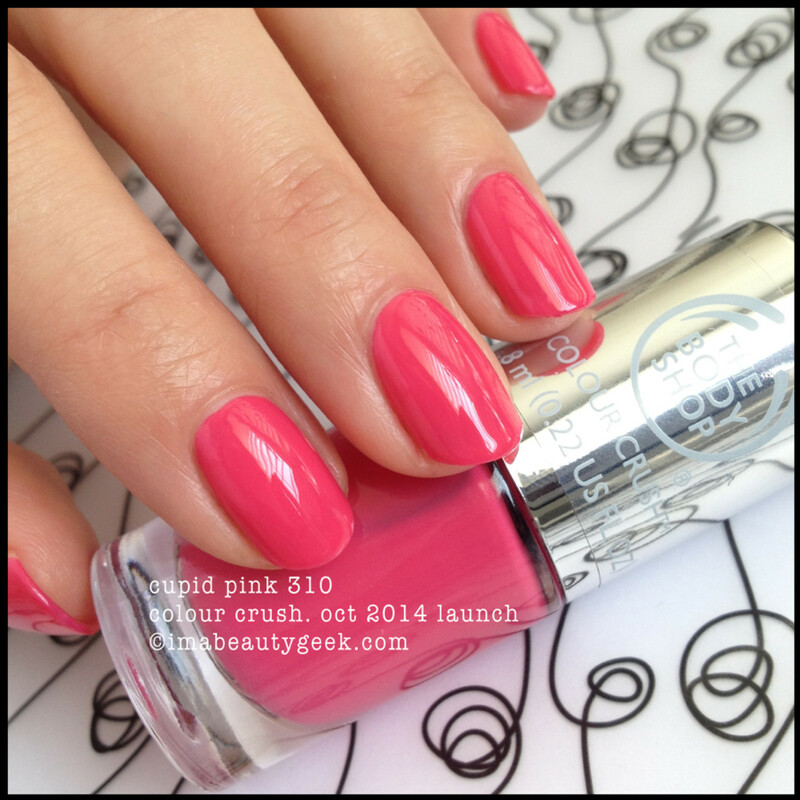 above: the body shop colour crush just peachy 201 The formula, brush, and shade are all A+. But peachy? No. Orange? Yes. above: the body shop colour crush peach babe 220 I tell ya what, the finish is lovely even before topcoat but I wore this around the house for a bit and discovered it was still fairly easy to dent 40 minutes later. 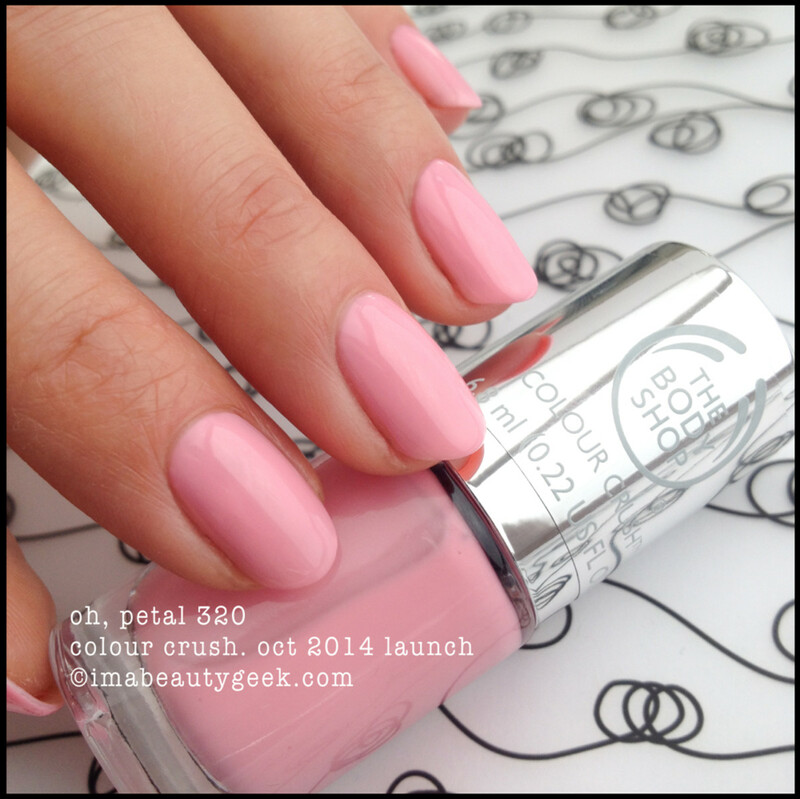 above: the body shop colour crush oh, petal 320 That’s two thick coats and again, it’s dry “to touch” fairly quickly but still not particularly quick dry if you get my meaning. You’re gonna need your QDTC*, yo. 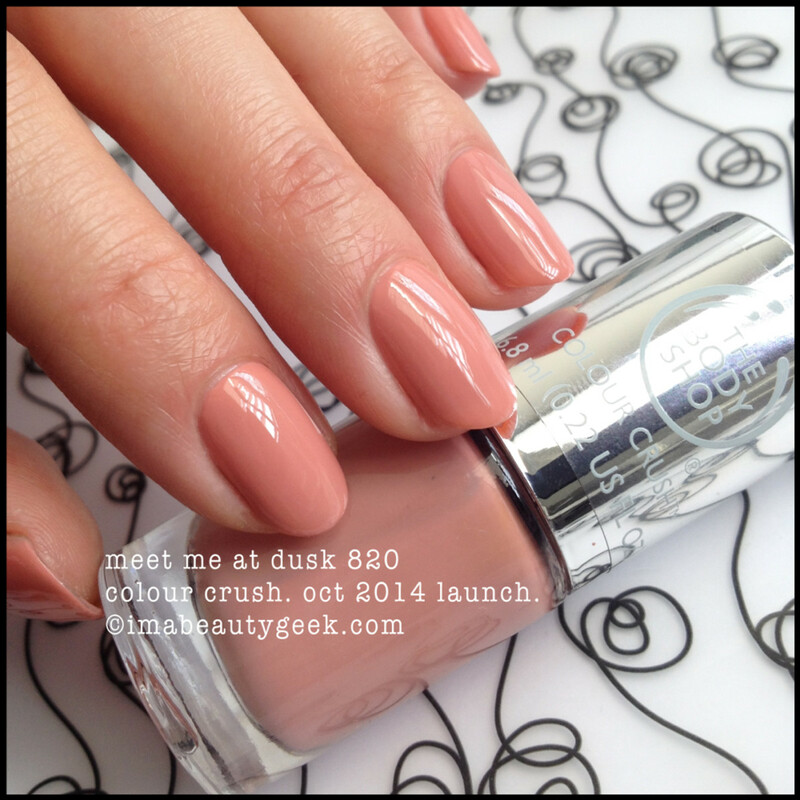 above: the body shop colour crush meet me at dusk 820 S’a really lovely dusty, dusty rose that takes me right back to 1982. That’s two coats to a perfect finish. 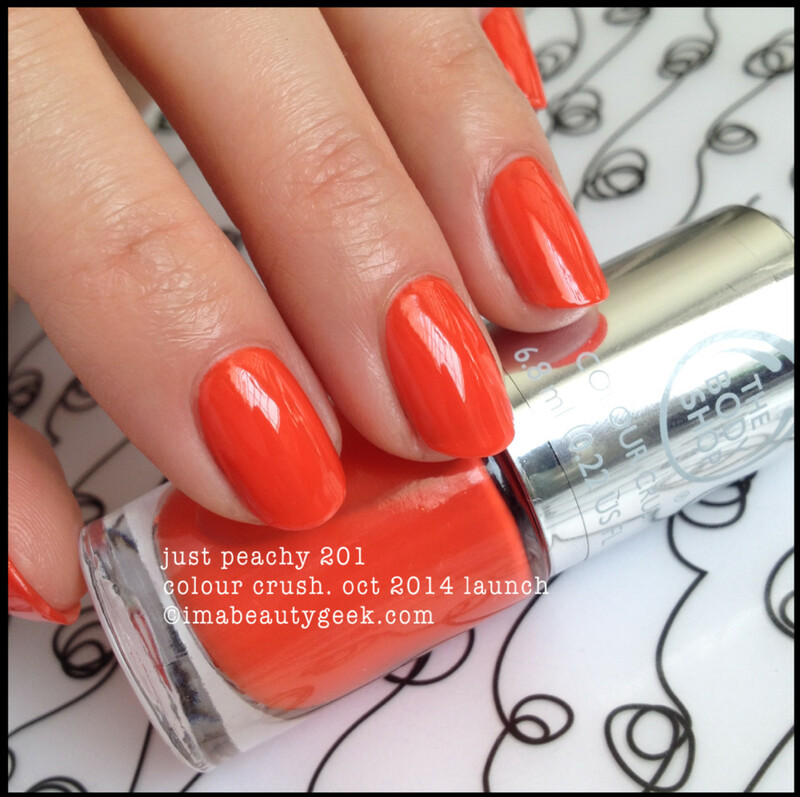 above: the body shop colour crush rosy cheeks 330 Two coats to what I think is a perfect peachy coral. above: the body shop colour crush cupid pink 310 The formula on this one feels thin at first but two coats actually does it all up to picture perfect. above: the body shop colour crush deeply in love 410 A wickedly appealing raspberry crème that almost appears squishy without a top coat. 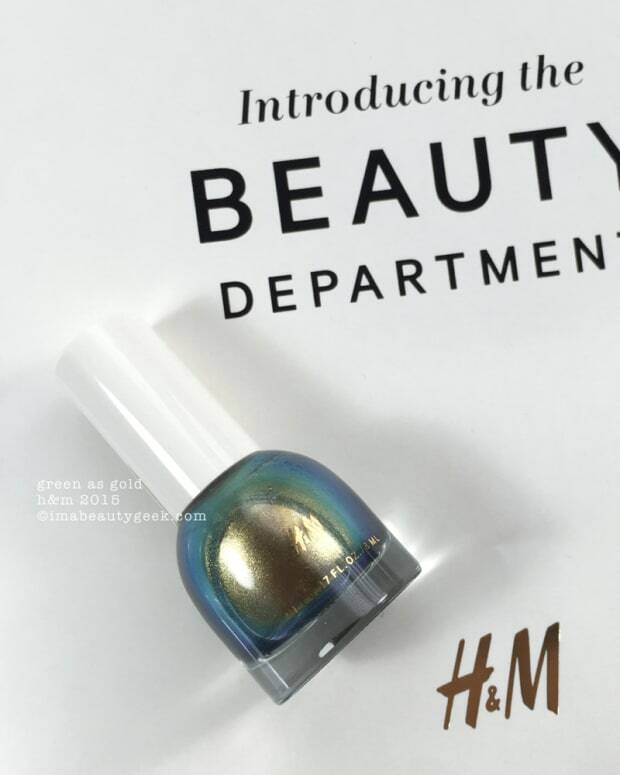 I got top coat on it there – sorry, I forgot to take the before TC pic… oops! above: the body shop colour crush a grape affair 420 That’s two coats and as of now, I think I’m in love with this new line of polish. 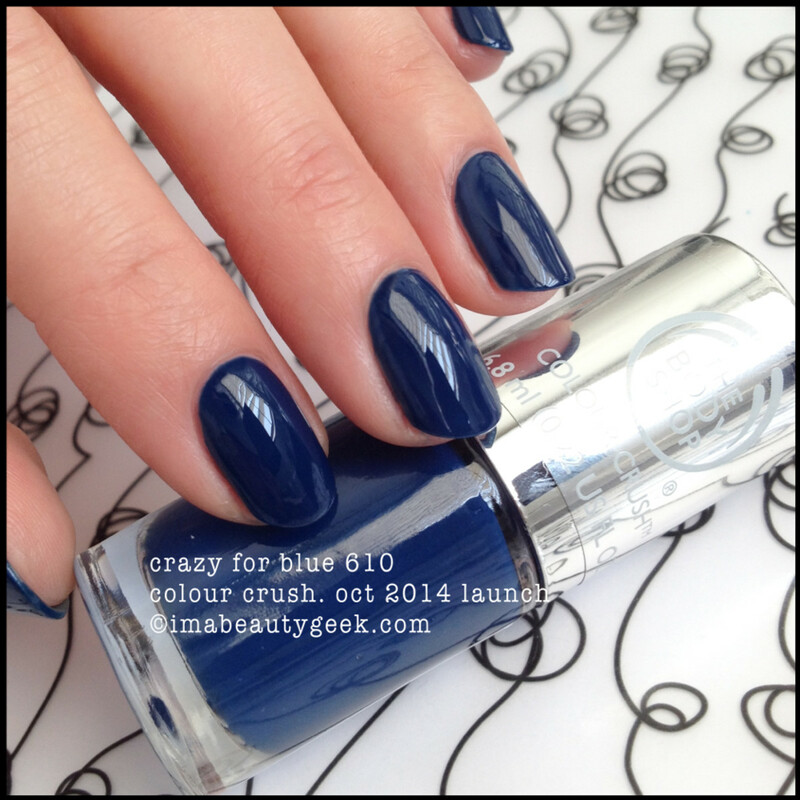 above: the body shop colour crush crazy for blue 610 Oooh! A nice, bright two-coater navy for fall! above: the body shop colour crush got the blues 620 The formula on this one again feels thin but I don’t mind because it’s completely opaque in two super-duper easy coats. Yep. 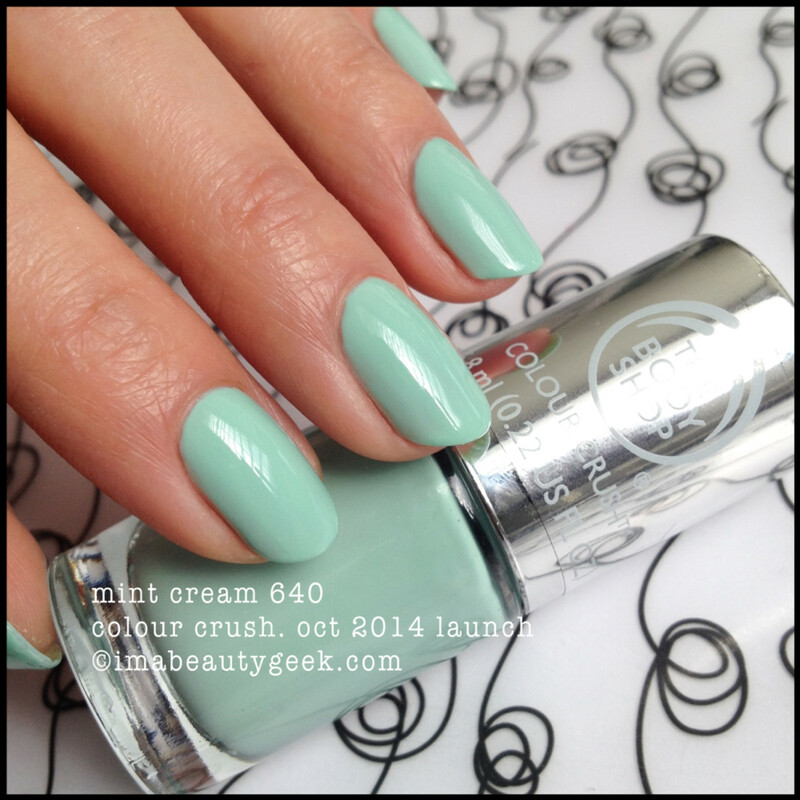 above: the body shop colour crush minty amour 630 Gah! I love this shade so much! Two effortless coats = true love. above: the body shop colour crush mint cream 640 Guess what! Yep, two coats to a pretty pastel mint green. 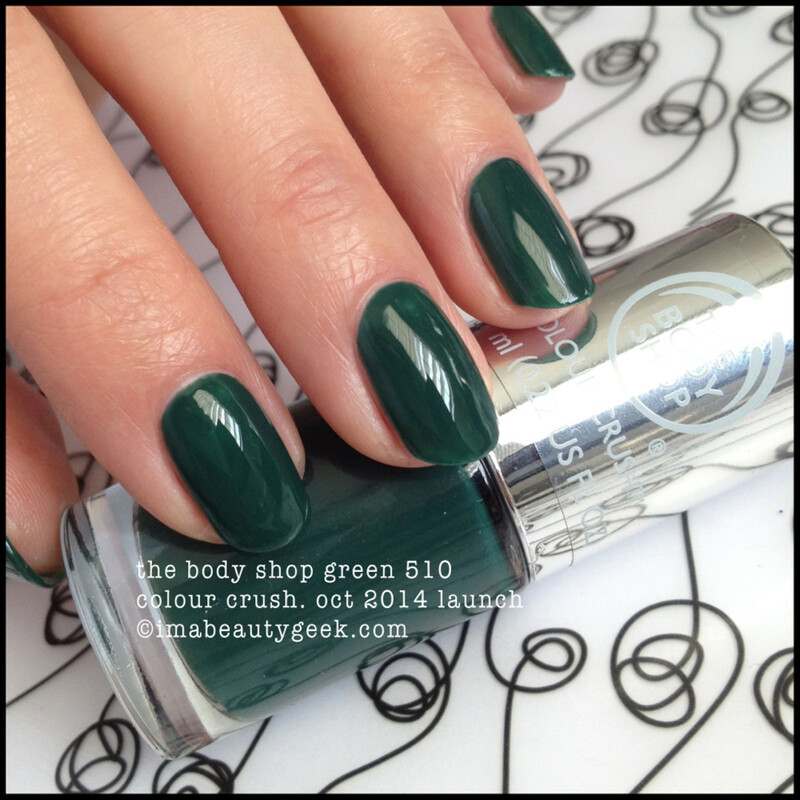 above: the body shop colour crush hemp over heels 520 My, what a disturbing shade of green this is in two coats. It’s one of those colours I like to wear simply for the “odd” factor. Ya dig? above: the body shop colour crush the body shop green 510 Is it just me or does this make you think “Christmas Tree”, too? 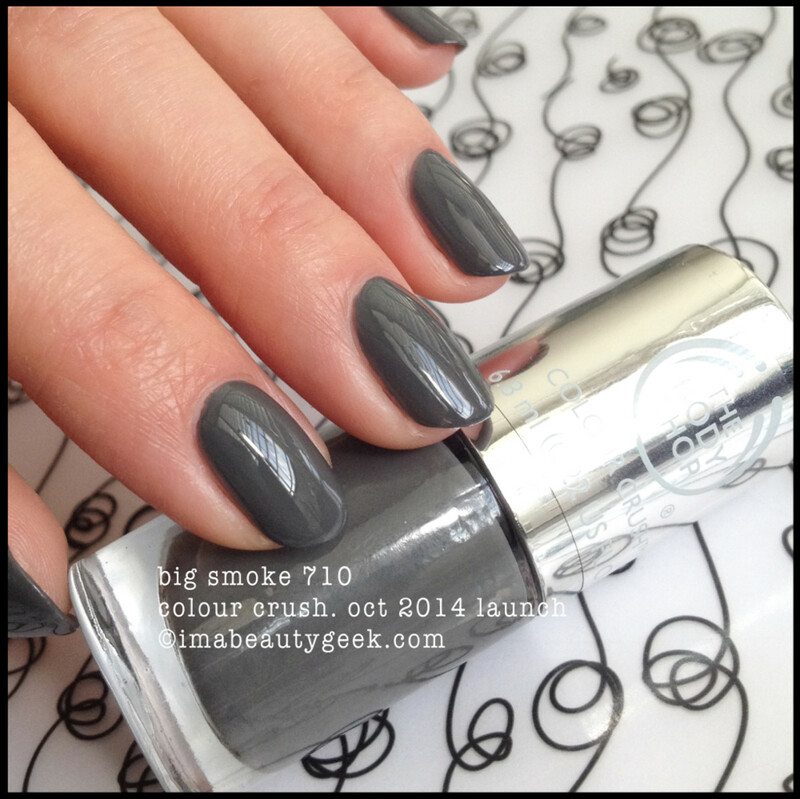 above: the body shop colour crush big smoke 710 That’s two coats. I thought I could do it in one but I’m a failure. Don’t care though ’cause it’s kind of a great smoky grey, huh? 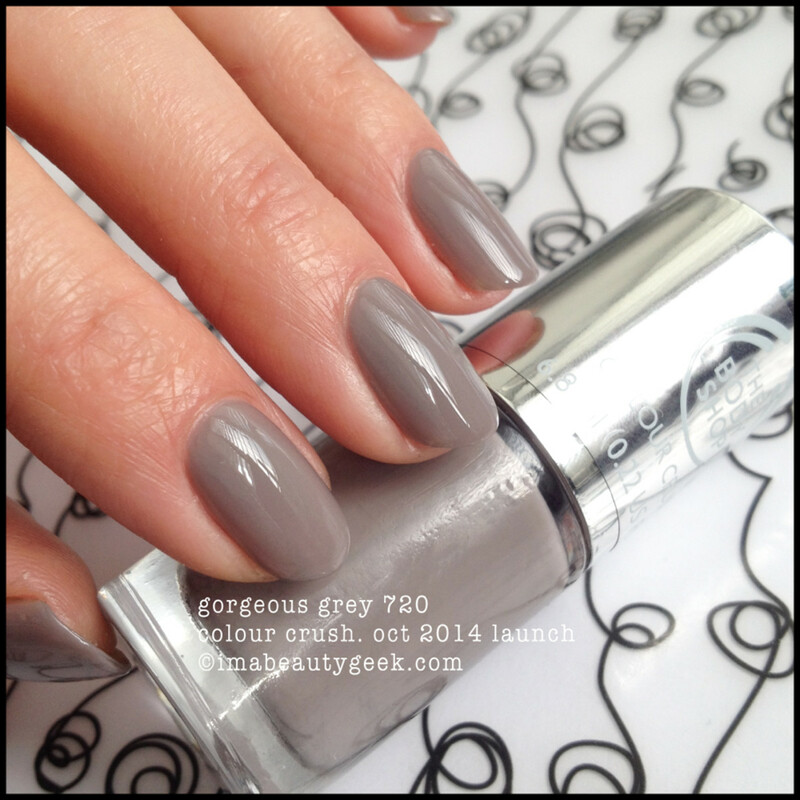 above: the body shop colour crush gorgeous grey 720 The shade chart says it’s called Gorgeous in Grey but the bottle label doesn’t have the “in”. The formula is a touch thin and it’s a little more taupe-y than grey but it’s still awfully sophisticated for fall. You’re gonna wanna shake the crap out if though – the black in there settles. above: the body shop colour crush almond kiss 730 Two coats to a nice plasticized kind of finish that has a really pretty kind of shine and dries quickly to the touch. 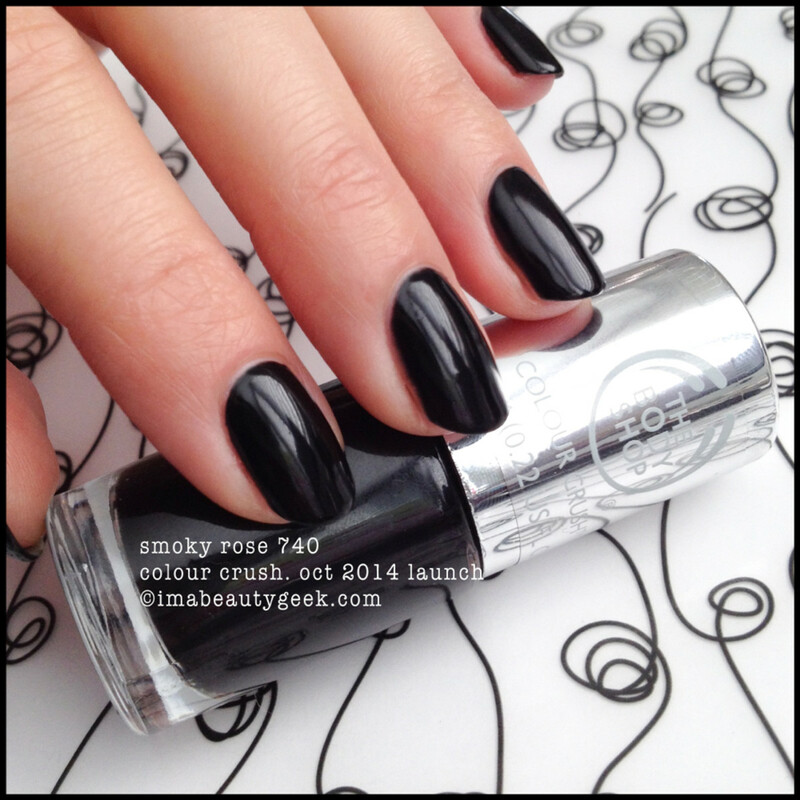 above: the body shop colour crush smoky rose 740 It’s black with a teeny-tiny barely noticeable shot of grey. Also, it gives me lobster hands. Also, it takes two coats so it won’t be my new best black ever. above: the body shop colour crush frosting fancy 810 She’s a little chalky and I couldn’t seem to get enough on the brush for good control AND perfect coverage so I had to “double-dip” for a couple fingers. That’s okay though ’cause if you work quickly enough, the level is superb. That’s three coats to perfectly streak-free coverage. I DO love a barely pink shade of white. 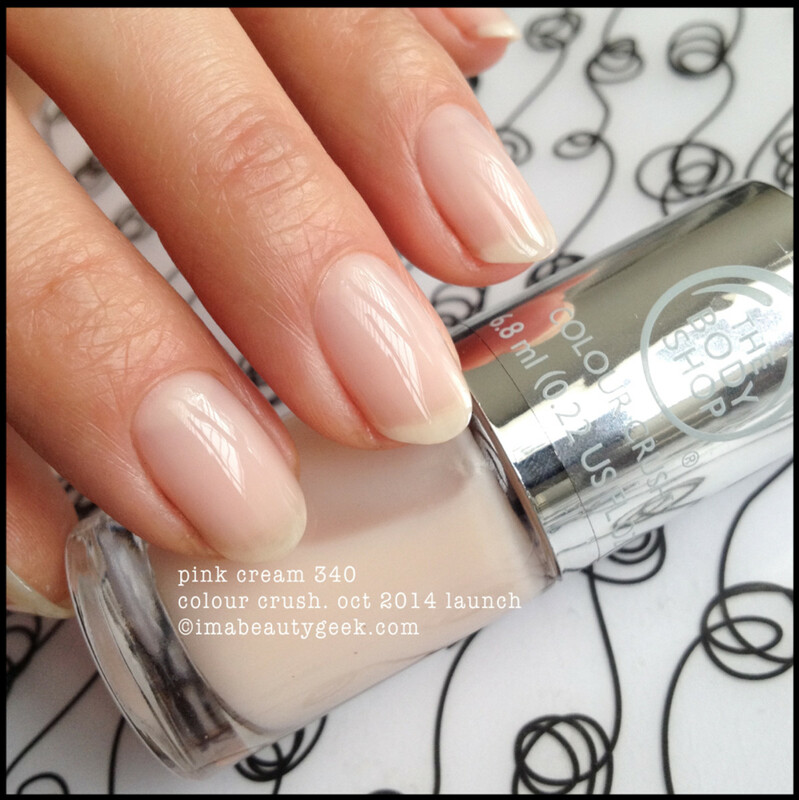 above: the body shop colour crush pink cream 340 Did I mention I love the brush? Yep, I do. I did two coats here for that pretty-yet-sheer kinda coverage. above: the body shop colour crush brush Lastly, the brush. It. is. good. There are a bunch of things not in these bottles – things like Dibutyl Phthalate, Formaldehyde, Formaldehyde Resin, and Camphor. Also missing is Toluene. Depending where you are in the world, that means 4-free or 5-free (4-free in Canada because Toluene is already banned here). That’s good news, right? And then I wanted to let you know how I feel about this polish/brush combination. I love it! This formula and that flexible brush make for precision application. We all know how much I like a brush that does what it’s supposed to do. It makes polishing such a pleasure when the stuff goes exactly where I want it to. 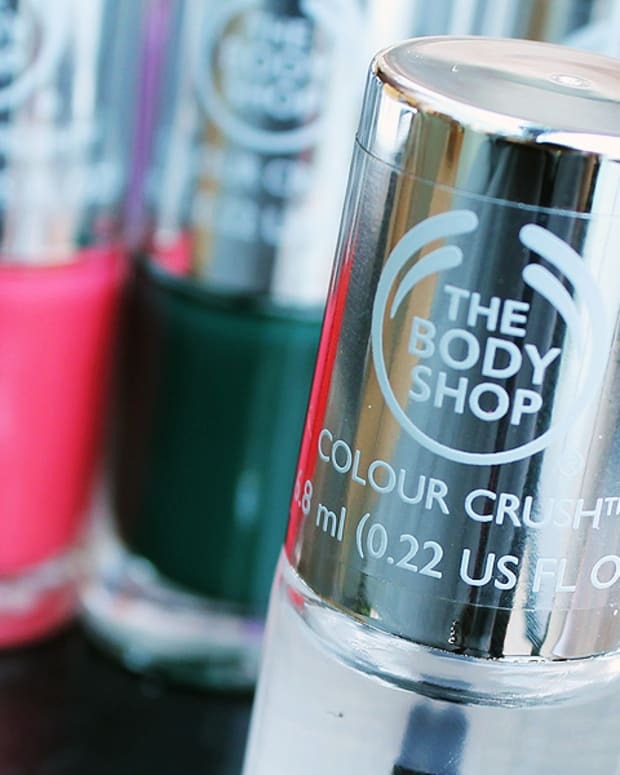 If you’re a fan of vegan-friendly polish this Body Shop Colour Crush Nails stuff is for you – it’s created without any animal derivatives and it isn’t tested on animals either. The formula is good, the brush is good, the shine is good, and the bottles are good. Did I also mention the price is nice? Am I a fan, you betcha. Given what’s not in the bottles, I’d say this is a stupendous choice for anyone who wants their polish to be high quality with a conscience. Now that you’ve seen all the swatches, you gonna get some? 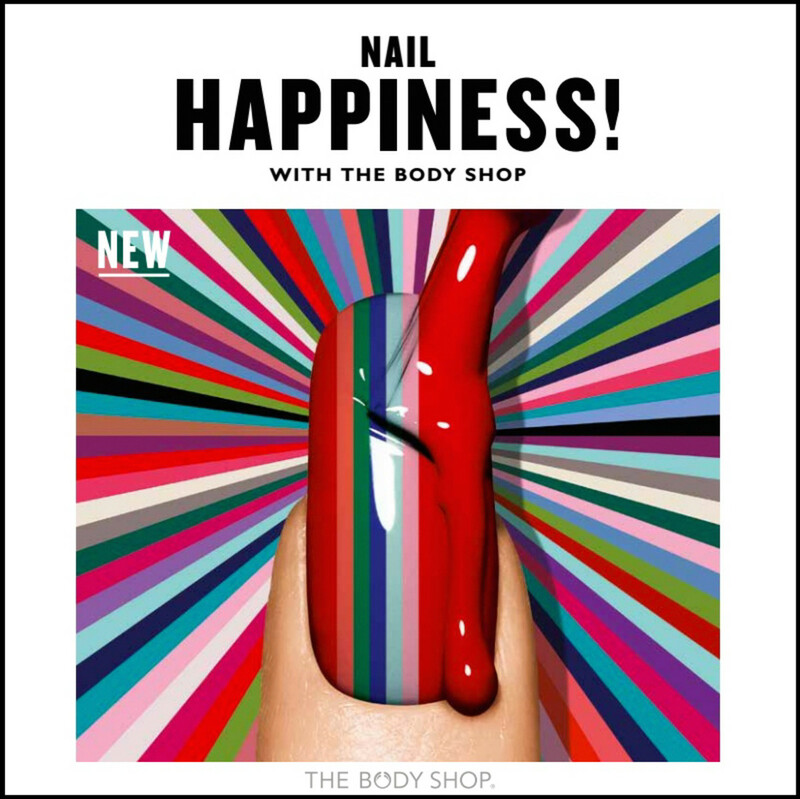 Body Shop Colour Crush Nails ($6/shade at thebodyshop.ca and $8/shade at thebodyshop-usa.com) will be available in-store in October 2014. Manicures and photographs by Karen Falcon (she’s gonna need more swatch wheels if this keeps up) ©2014 BEAUTYGEEKS/imabeautygeek.com.